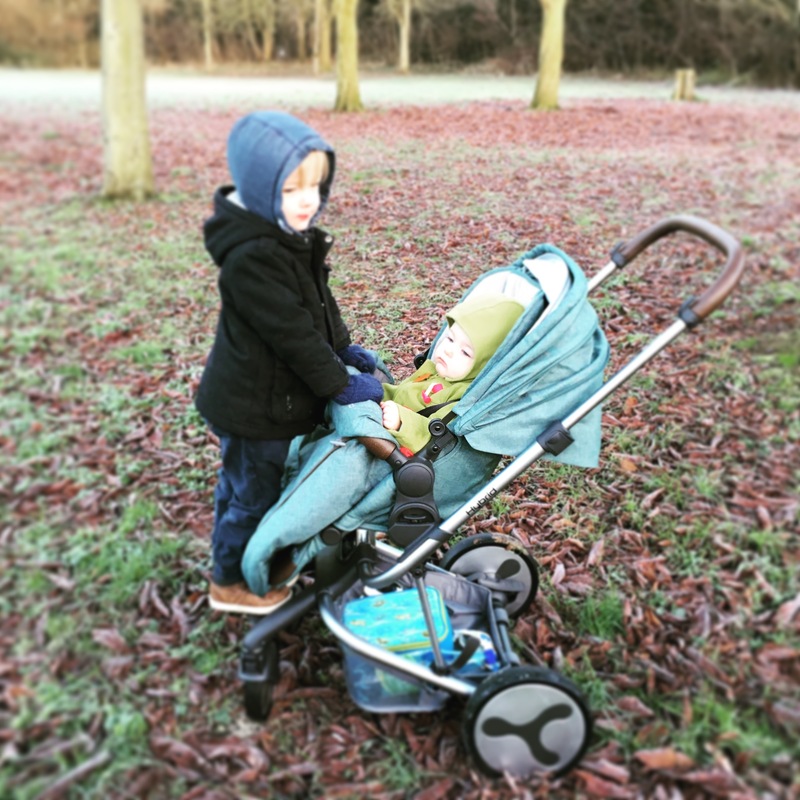 The BabyStyle Hybrid – Review part one. You may have noticed recently that I have been doing a lot of raving about this new stroller from BabyStyle. Babystyle are responsible for the Egg and the Oyster models and the Hybrid is their latest offering. 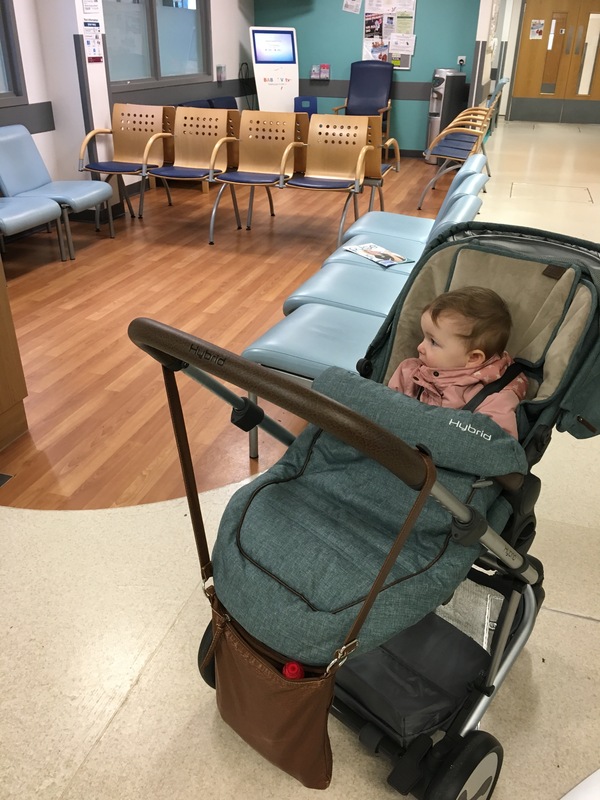 I recently went along to the launch event to learn a bit about the new travel system. I have since received the edge model in the mineral blue colour in exchange for an honest review. I’ll start with telling you about the single pushchair version that we currently have. Later in the year, when the new baby arrives, I will be able to tell you about using it as a tandem with the carry cot part too. Now honestly, I need to get this out of the way, but I LOVE this stroller. I’ve only found 2 little negatives, which I’ll come to shortly but other than that the whole thing is awesome. For a start, it is so simple to build. In the box, you get the chassis, 2 front wheels, 2 rear wheels, the seat, the cross bar and then a foot cover. Attach the back wheels first by just inserting the pins until they click. Then open up the chassis, tilt it back and add the front wheels. Stand it up to put the seat on and then the cross bar and then button on the foot cover. It’s that easy. I didn’t even look at the instructions. One you have assembled the Hybrid, you can adjust it so that it is comfortable for you and your baby. The seat has 3 levels of recline and is changeable with one hand. There is a catch at the back of the seat that you simply lift up and then just tilt into the position you want. The handle bar has 10 height levels and can be adjusted by undoing the catches at each side. Then just slide the handle up or down to the level that is comfortable. The seat is easily changed from parent facing to world facing by squeezing the clips at the side and lifting. You can see that demonstrated in the above video. What is the Hybrid actually like? For a basket that looks so small, it sure does a lot of donkey work! It’s all well and good me sitting here telling you how to build it and change it but that doesn’t tell you anything about using it out in the world. Well here’s a clue… If I’m alone with the kiddies, then I get to push it… If I’m with my mum or Liam… I don’t get a look in! Ermm ok mum, that’s great – BUT I WANNA DO THE BUGGY!! It’s very smooth to push, theres nothing too strenuous about it, it just goes. It’s so easy to adjust and its comfortable. The basket doesn’t look like much to begin with but it holds a decent amount (Dexter has even had a ride in there!) and there is a flap that lifts up to give a higher basket wall. Not only that, if you do manage to fill the basket, there are little bits that stick out of the handle to hold your bags on too. I’ll admit, there are bits that could be better but overall, I am in love with an inanimate object! Sorry, there have to be some and I’d be lying if I said there weren’t any. *Adjusting the shoulder straps – This is the first time I looked at the instructions. It just wasn’t easy or instinctive. In fact it was actually quite fiddly. I may film another quick video to show you how to do that bit because I think it would be rather helpful. *The padded strap covers – I don’t like them. Of course this is just my opinion but I find they twist round and then twist the straps up and truthfully I find them a bit annoying so I’ve taken them off. Easily done, they’re just on with velcro. Casually waiting at the hospital for our appointment. In the last month that I have owned the Hybrid, it has been EVERYWHERE! It’s so nice to push, I just keep finding reasons to take it out! Also, you can see here the bag catch in use on the handle. As of yet, Babystyle don’t currently have a buggy board that fits it but we have purchased the Lascal Mini. It fits on ok but isn’t perfect as it covers the brake and then engages it when you go up steps or curbs. We’ve managed to work round this by only using dropped curbs or asking Dexter to just jump off when there are larger ones. I can’t get my foot to the brake with the buggy board on so would have to use my hand but I can disengage it with my foot easily enough as I can still get underneath. 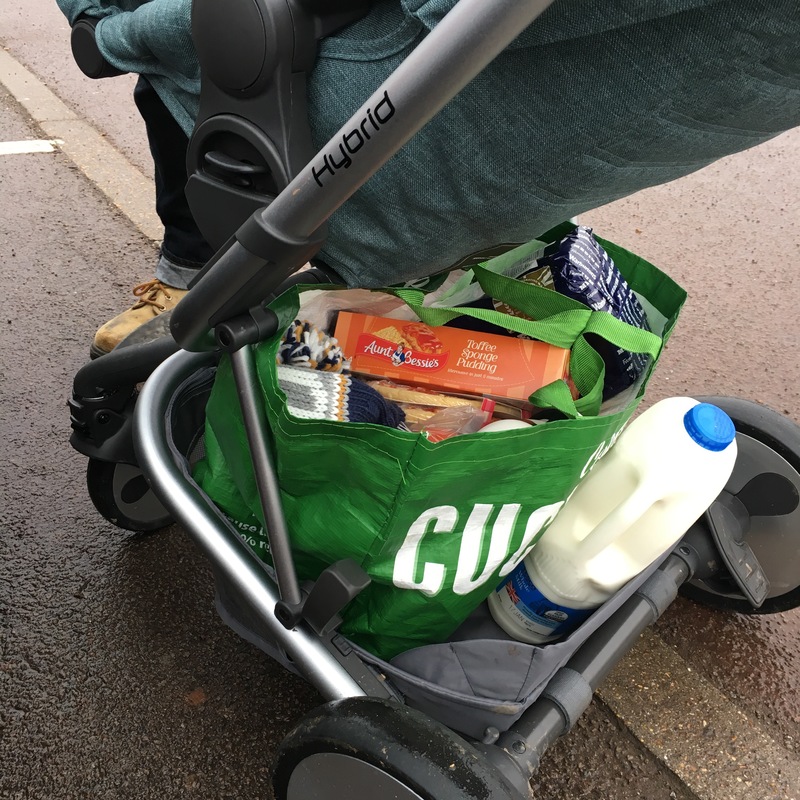 But thats nothing to do with the stroller itself, of course not everyone will even need a buggy board. Just something to consider. The tires.. Puncture resistant! I can’t tell you how many times I got annoyed with Dexters stroller constantly going flat so that is a big plus for us! Excellent large hood! The hood actually has a zip so that you can extend it further and with the pull out sun canopy it almost completely covers the top of the seat. Especially good for napping babies to block out the light or for blocking out harsh winter winds. Easy one hand fold. Underneath the seat you will see a handle and a button. Simply lift the handle with your fingers and push the button/catch down with your thumb and lift towards you – et voila. It can collapse with the seat on but is much easier without (that part requires two hands). The only other thing I would say is if you do buy it, please go and see it first. My ONLY reason for saying this is the colour options. They look great online as you can see, but they look AMAZING in the flesh. I plan on doing a few more youtube vids just to show you those fiddly straps and converting from Edge to Tandem. If you watch the vid near the toporthe one below showing our favourite features, just hit subscribe and you’ll be able to see those new videos when they’re done. I hope you’ve found this review helpful, please feel free to ask any questions in the comments if you think I’ve missed anything. Did you ever make a video about the straps? I have the hybrid too and find them difficult to adjust. Also, when my little one is wearing a big coat for these cold months, when pulled on loosest setting, it is very very tight. Is there another way to losen them or get a bit more space? Hello, Sorry, no I didn’t… But I will now. I’ll drop you an email when I’ve got it done. I’ll do it as soon as I can. Hi, I’m also struggling with the straps but can’t find a video, mine didn’t come with instructions. Can you help please? ?